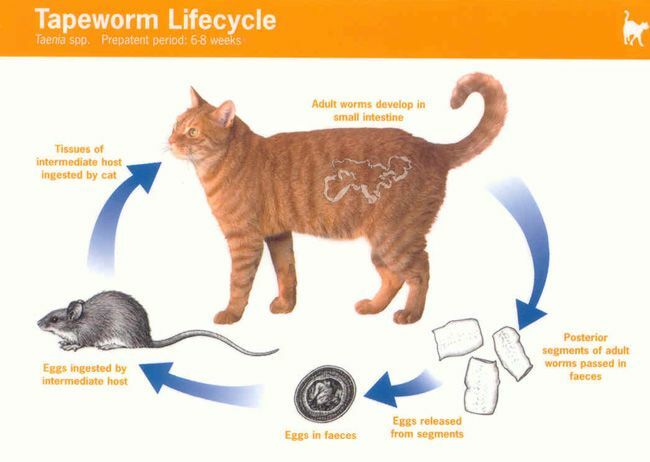 Intestinal Parasites by All Creatures Veterinary Hospital, Inc.
Cats and dogs can harbor this dangerous parasite that can be transmitted to you so it is of utmost importance to see to it that your pets do not carry this worm in their intestinal tract. Most worm infections in people occur in children who play outdoors in sandboxes, or other dirty areas that cats and dogs may use as a toilet. The microscopic eggs that the adult roundworm lays can be found in your pet's feces and the human that comes in contact with them in their environment can become infected. This parasite does not follow the normal life cycle that it has in the pet and it will migrate into other tissues in us that can lead to blindness or even brain injury. This is why we start your puppy or kitten on a deworming program as soon as possible. Dogs can pass this infection to their unborn through the placenta so pups will be able to infect their environment starting at about 8 weeks of age...just when they are weaned and given up for adoption in front of the grocery store or sold through a private party. Kittens become infected soon after birth from their relatives or their environment so they will shed this parasite's eggs a bit later in life, but the outcome is the same...you and your family are at risk of infection. The dogs and cats that are seen once a year for their physical exam should be dewormed during this opportunity too. 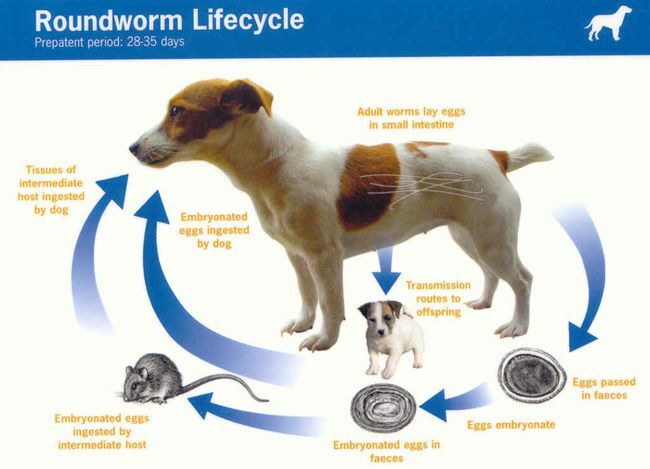 Many dogs receive monthly de-wormer for this parasite in their heartworm prevention that we recommend. If you see spaghetti-like worms in your pet's feces then you have acted too late. Deworming should have been implemented 2 months earlier. It is always best to deworm in this instance as soon as possible and deworm all exposed pets. Pyrantel Pamoate is used and is effective. This dose is repeated 2 weeks later to complete the kill cycle. This nasty parasite has most people calling the vet to say they found "little rice grains" on their pet's rear end or their pet is "scooting". By the time this parasite is obvious, it has been dropped into your environment for days; ready to infect the next person or pet that comes along. Self infection is the most common infection as your pet grooms himself. Each piece of the tapeworm has thousands of eggs inside and it doesn't take a large sample to infect. In humans, the infection again, doesn't follow the regular intestinal path as it does in our pets; it migrates to brain and other tissues to cause often fatal consequences. Our pets can become infected two different ways. One is by eating a flea during grooming rituals. The infant form of this parasite is inside the flea and ready to finish it's lifecycle once inside your pet. The other way your pet can become infected is to eat the meat of small mammals and birds. They carry another form of this parasite in their tissue and once your pet eats this animal the parasite can finish it's life cycle. The best tapeworm medication is called Praziquantal and it can be given by injection or taken in pill form. It is over the counter in pill form so you can find it in most feed stores. If you have a hunting cat or dog or they have exposure to fleas, then deworming every 3 months is enough to control this parasite. Dogs receiving our heartworm prevention that contain Praziquantal will be dewormed for this parasite monthly as well.